Book Your Medical Marijuana Certification Appointment Today! The health benefits of lavender essential oil include its ability to eliminate nervous tension, relieve pain, disinfect the scalp and skin, enhance blood circulation, and treat respiratory problems. The Latin name of lavender is Lavare, which means “to wash”, due to its particularly pleasant aroma. Lavender oil is extracted mostly from the flowers of the lavender plant, primarily through steam distillation. The flowers of lavender are fragrant in nature and have been used for making potpourri for centuries. Traditionally, lavender essential oil has also been used in making perfumes. The oil is very useful in aromatherapy and many aromatic preparations and combinations. Lavender oil blends well with many other essential oils including cedarwood, pine, clary sage, geranium, and nutmeg. Today, lavender essential oil is frequently used in various forms including as an aromatherapy oil, in gels, infusions, lotions, and soaps. The smell of lavender essential oil is potent for many types of bugs like mosquitoes, midges, and moths. Apply some lavender oil on the exposed skin when outside to prevent these irritating bites. Furthermore, if you do happen to be bitten by one of those bugs, lavender essential oil has anti-inflammatory qualities that will reduce the irritation and the pain associated with bug bites. Lavender essential oil induces sleep and is thus used as an alternative treatment for insomnia. Frequent studies on elderly patients have shown an increase in their sleep regularity when their normal sleep medication is replaced with some lavender essential oil being placed on their pillows. It has a relaxing impact on people; thereby, it often replaces modern medicines for sleep issues. Lavender essential oil has a calming scent which makes it an excellent tonic for the nerves and anxiety issues. Therefore, it can also be helpful in treating migraines, headaches, depression, nervous tension and emotional stress. The refreshing aroma removes nervous exhaustion and restlessness while also increasing mental activity. It has a well-researched impact on the autonomic nervous system, which is why it is frequently used as a treatment for insomnia and also as a way to regulate heart-rate variability. One study showed that people taking tests showed a significant decrease in mental stress and anxiety, as well as increased cognitive function when they inhaled lavender oil and rosemary oil before taking the test. According to dermatologists and aromatherapists, lavender essential oil is one of the most beneficial oils in the treatment of acne, which is a very uncomfortable and embarrassing condition that primarily affects young people as they move through puberty, but can also afflict adults. It is characterized by red, raised sores on the face and body that develop due to a bacterial infection near the sebum gland. When sebum cannot be properly secreted from the sebum glands on the face, it begins to build up, particularly because puberty stimulates extra sebum and bacteria feed off of it, creating a vicious cycle of irritation, infection, and visible sores that can result in serious scarring. Lavender essential oil inhibits the bacteria that cause the initial infection, helps to regulate some of the over-excretion of sebum by hormonal manipulation and can reduce the signs of scarring after the acne has begun to heal. Adding a small amount of lavender essential oil to other skin creams or ointments can greatly increase the potential for relief and healing. pains including those caused by sore and tense muscles, muscular aches, rheumatism, sprains, backache, and lumbago. A regular massage with lavender oil can provide relief from pain in the joints. A study done on postoperative pain relief showed that combining lavender essential oil vapor into the oxygen significantly reduced the amount of pain experienced, versus those patients who were only revived with oxygen after a major surgery. Lavender essential oil is good for urinary disorders because of its stimulating effect on urine production. Furthermore, it helps in restoring hormonal balance and reducing cystitis or inflammation of the urinary bladder. It also reduces associated cramps with these and other disorders. Lavender oil is widely used for various respiratory problems including throat infection, flu, cough, cold, asthma, sinus congestion, bronchitis, whooping cough, laryngitis, and tonsillitis. The oil is either used in the form of vapor or is applied to the skin of neck, chest, and back. It is also added to many vaporizers and inhalers that are commonly used for cold and cough. The stimulating nature of lavender essential oil can also loosen up the phlegm and relieve congestion associated with respiratory conditions, thus speeding up the recovery process and helping the body naturally eliminate phlegm and other unwanted material. The vapor of lavender essential oil also has antibacterial qualities which can battle respiratory tract infections. Lavender essential oil is useful for hair care because it has been shown to be very effective on lice, lice eggs, and nits. Furthermore, lavender essential oil has also been shown to be very helpful in the treatment of hair loss, particularly for patients who suffer from alopecia, an autoimmune disease where the body rejects its own hair follicles. A Scottish study reported that more than 40% of alopecia patients in the study reported an increase in hair growth when they regularly rubbed lavender essential oil into their scalp. Therefore, lavender oil is sometimes recommended as a preventative measure for male pattern baldness. 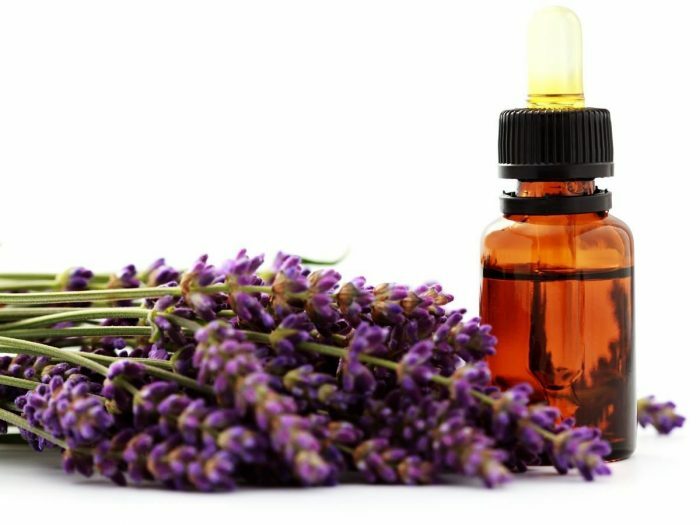 There is a significant research on the effects of lavender, in combination with other essential oils, as a way to prevent the occurrence of breast cancer in mice. This could be an indication of an increased chance of lavender battling carcinogenic effects and the presence of cancer. Lavender essential oil is also good for improving circulation of blood in the body. Research suggests that aromatherapy using lavender oil has beneficial effects on coronary circulation. It also lowers blood pressure and is often used as a treatment for hypertension. This means that not only do the organs increase their levels of oxygenation, promoting muscle strength and health, but brain activity can have a noticeable boost, skin remains bright and flushed with blood, and the body is protected from the risks of heart attack and atherosclerosis often associated with poor blood circulation. Lavender oil is useful for digestion because it increases the mobility of food within the intestine. The oil also stimulates the production of gastric juices and bile, thus aiding in the treatment of indigestion, stomach pain, colic, flatulence, vomiting, and diarrhea. Regular use of lavender essential oil provides resistance to a variety of diseases. Lavender has antibacterial and antiviral qualities that make it perfect for defending the body against rare diseases like TB, typhoid, and diphtheria, according to early research in the 20th century. It is used to treat various skin disorders such as acne, wrinkles, psoriasis, and other inflammatory conditions. It is commonly used to speed up the healing process of wounds, cuts, burns, and sunburns because it improves the formation of scar tissues. Lavender oil is also added to chamomile to treat eczema. Other health benefits of lavender essential oil include its ability to treat leucorrhoea. The oil can also be used to repel mosquitoes and moths, so you may find many mosquito repellents containing lavender oil as one of the primary ingredients. Word of Caution: As with many other essential oils, pregnant and breastfeeding women should avoid using lavender essential oil. It is also recommended that patients with diabetes stay away from lavender oil. It may also cause allergic reactions to people who have unusually sensitive skin. Some people may also witness nausea, vomiting, and headaches due to excessive use of lavender oil. 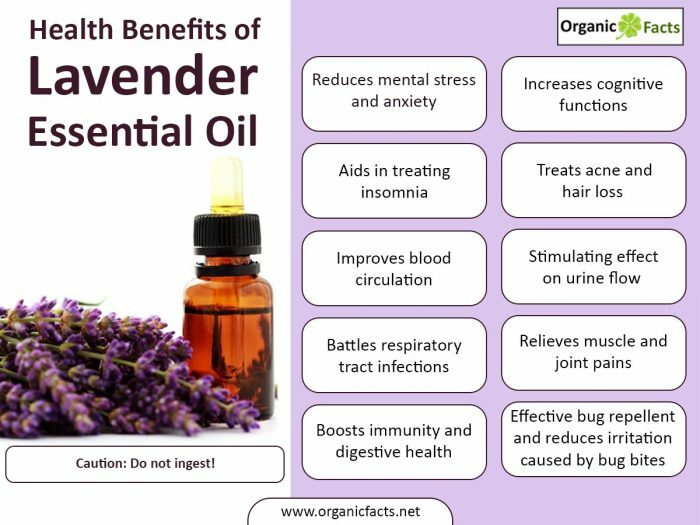 Most importantly, lavender oil should never be ingested, only topically applied or inhaled through means of aromatherapy or similar activities. Ingestion can cause serious health complications, characterized by blurred vision, difficulty in breathing, burning eyes, vomiting, and diarrhea. So, even if you think that lavender oil is a wonderful cure, don’t get excited and start putting it on your food. Smoking vs Eating Cannabis, Which Method is for Me?? ?